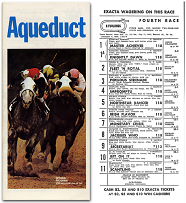 Eleven days after his racing debut Secretariat was back at the races at Aqueduct Race Course. 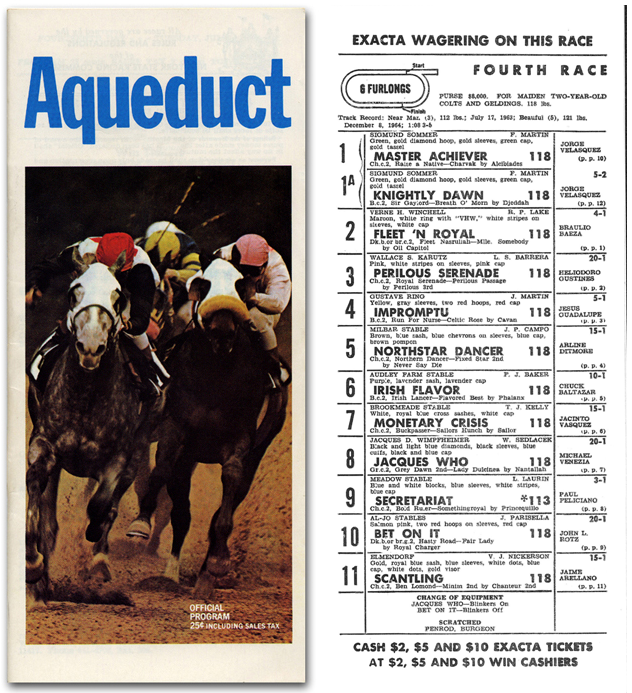 The strong betting favorite, and this time he would win.Not a perfect start, but like his first race when he ran fourth, Secretariat would again display the powerful stretch- running ability that would become his hallmark: the farther they ran, the stronger he was. Paul Feliciano, apprentice rider working for trainer Lucien Laurin, and the brother of veteran jock Ben Feliciano, was aboard Secretariat again. Next, the stable would ship north from Long Islan d to the late-summer “Spa” at Saratoga Race Course, in upstate Saratoga Springs, N.Y. Since the Civil War, Saratoga has been the summertime racing playground of the rich and famous — and their rich and famous racehorses. At Saratoga, the eyes of the racing world would become focused on the Big Red horse.